Math Help and Math Tutoring in Lisgar, Meadowvale and Mississauga. Hello. I'm Kyle Tan, Centre Director of Mathnasium of Meadowvale, your neighbourhood math-only learning centre. We help kids in grades K-12 understand math by teaching the way that makes sense to them. Opened in August 2017, Mathnasium of Meadowvale is conveniently located in Mississauga, at Meadowvale Town Centre, where Karachi Kitchen, Tech & Sell and Burrito Boyz are located. Our instructors are heavily vetted on their Math skills and personality, during the interview process., before they are accepted. 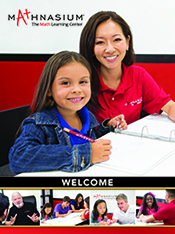 Reach out to us now to learn how Mathnasium can help develop your child's potentials in Math! Meadowvale has been very good at addressing our son’s individualized education plan from school. Victoria provides terrific guidance to help him understand his math. The report cards on his status are great to keep us posted on his progress too. Thanks Kyle! A really great staff. My son loves going here and learns a lot. Very caring. It has built conidence in his learning. Still a slow process for him due to is Learning challenges The extra help and repetition and Math being a part of his life has built his confidence and self esteem. In his classroom he is able to participate with the understanding of math around his classmates. You guys have brought the fun aspects of learning mathematics. Great jo! Since the moment Mia started with Mathnasium the staff made her feel welcome and part of the group. Her math marks starting showing an almost immediate improvement as they initially focused on her current programming and have since worked to fill in the gaps. Her overall enjoyment for math has returned and she is eager to keep doing well. I never expected it to be this successful in getting her back on track. Thanks to Kyle and his crew for getting Mia back on the path to Success! It has been a great experience with Mathnasium so far. It is different than many other programs we have tried. Our child looks forward going in each week. There are many activities and point system to keep the children going with learning. Thanks for making a difference in our child's learning. We greatly appreciated each of the staffs at the centre. Keep up the great works! Thank you so much for your help, my daughter had some problems in math in her first year of high school, fortunately she passed. good curriculum and teaching style. great caring service. From stepping into the location to enrolling and since then Kyle has been very focused on getting The best results for our daughter. Toby since joining Mathnasium of Meadowvale has greatly improved in Math; not only has he maintained higher scores, the speed of his analytical thinking has continued to improve to the amazement of his classmates and the delight of his Math teacher. Dedicated and patient instructors and who go out to help the children. An exellent learning environment for children. Staff are great. My son enjoys going to math and loves it. Kyle's doing a great job! My son loves going to Mathnesium and that says a lot about the experience being delivered. Kyle and his team are patient with my daughter. They have helped my daughter to enjoy learning math. Such a good investment in my child’s education. My daughter loves to go to Mathnesium. She has improved a lot in past couple of months. Thank you Kyle and his team!! Our son's attitude towards math and numbers in general has turned around since we enrolled him at Mathnasium. The staff seem to play a key role in making math a more enjoyable subject for kids. Incredible in every way! Our kids gained huge confidence and were actually looking forward to return every time. Great teacher methods and assessments. My daughter walked into Mathnasium hating math, with a fixed mindset that she was never going to be good at it. We only worked with the Meadowvale team for a summer but she left confident, with more strategies in her math arsenal, and begging to go back over the Christmas holidays. A huge thank you to Kyle and Myriam for their support as my daughter developed a growth mindset! School has started and she told me she handles math “like a boss” and she’s loving it. Keep up the effort of giving the parents all the information we need. Communication is very important to us. And the confident of your students give us peace of mind. Thank you for the job well done! My son has been with Mathnasium for 1 month. As we enter a new school session, I will follow up with his school teacher to determine extent of his improvement and be able to give a more detailed evaluation. My daughter started Mathanisum only a month ago but she is already feeling confident and comfortable with her Maths Skills. This is greatly because of method of teaching and support provided by the staff. The fact that each child has an individual growth path, and that Mathnasium recognizes and works with each child’s learning path, is one of the reasons why I would recommend Mathnasium. The updates/assessments are well communicated. My kids thoroughly enjoy their time at Mathnasium and feel comfortable with the teachers. Their confidence has also grown. Mathnasium and Kyle’s team of dedicated specialists ensure a wonderful place where children find confidence and strength in their abilities. The environment and genuineness that Kyle and his team exudes makes such a difference in the child’s development and progress. I have had my daughter enrolled for a year now and have seen her grades improve, she is getting A’s now and understands the foundation of what is needed to help her succeed as she continues to gain confidence, grow and learn the fundamentals of math. My son has remain enthusiastic since being registered at Mathnasium and there is significant improvement in his comprehension and grades in Math. I believe this is a testament to the great work being done by the staff at Mathnasium. Thank you. Thanks to Mathnasium I was able to have a precise diagnosis of my children's math knowledge. Now I have a better idea of which subjects we need to work on. Thanks again! Great place to keep up the interest in math for kids. Very dedicated and kind teachers. Professional service with high quality. Best in Mississauga. My daughter had only few lessons but I have already seen change in her. She is more focused now and is also getting confidence working independently. The staffs are friendly, ready and willing to teacher. My daughter likes to go to the class. Great learning environment, my son is really happy and always tells me that the people there is so nice, I have seen a lot of improvement in this first 13 sesions. Kids are really enjoying the program so far! Great centre. Super friendly and helped my daughter learn her grade 8 & 9 math. Would recommend this centre. My daughter loves coming to Mathnasium because she actually realizes that math is an interesting and important subject. This is all thanks to dedicated and an experienced staff working in Mathnasium. I feel more secured knowing that Mathnasium will help her to deal with any knowledge gaps and assist her with building confidence in solving math problems. In addition, I appreciate open and honest feedback and regular updates from the director of the Center. Lessons and activities are very engaging, and the reward system helps encourage our daughter to do her best. It is one of her most favorite extracurricular activities. Staff at Mathnasium is very friendly and knowledgeable. They help in clearing the doubts and make sure that child obtains mastery in each skill. Excellent place to learn math. Kyle and Lois exceptional in what they are doing. Overall the whole team is amazing, approachable. Always there to help when needed. Highly recommended. Thank you Kyle for all you help. You are great with kids. Your dedication, patience and uplifting attitude encourages them to enjoy math and believe in themselves. Thanks guys! We absolutely love Mathnasium!! The teachers were fantastic with the my children. They created a comfortable learning environment where the kids felt safe to try even if they weren't sure. The owners of the Meadowvale Mathnasium are amazing and do so much in the community! Flexible times, great and clean facility, enough teacher/assistance resources, relaxed environment for all ages. Results are sure to follow with consistency and dedication from students! Thanks Mathnasium method and Kyle's team passion, Elizabeth has started to enjoy math! Amazing staff!! Kyle and his team have been so great to my children. They made math exciting and fun to learn. It's been a great experience and would highly recommending them. Thank you Mathnasium!! Great program for all grade levels. A big thank you to Kyle and all his staff. The staff are so approachable and their is an immediate action toward the progress of the child.The place is conducive for learning and progress report is sent to the parents.Motivation is there given to the child to feel the eagerness to learn Math. Samantha is really happy and enjoying her learning experience. Thanks for your commitment and dedication. I have already recommended you to Jamal Khalil. He went to see you last week. His son has the assessment on Saturday. The staff was very friendly and they really care about teaching kids about.